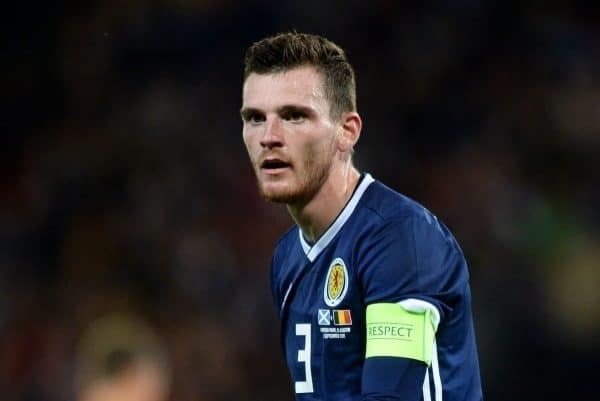 Andy Robertson will miss Scotland’s upcoming Euro 2020 qualifier at Kazakhstan, but his temporary spell on the sidelines can be seen as a positive for Liverpool. 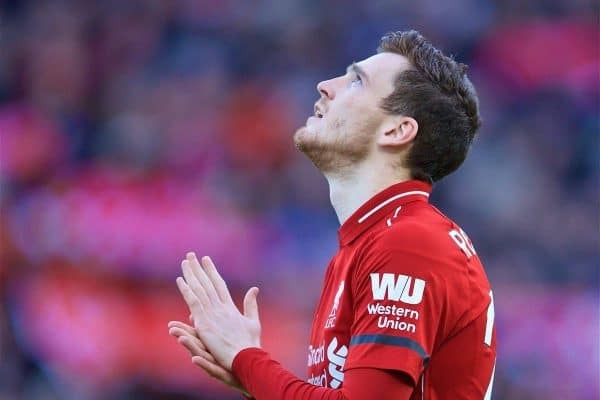 Robertson has been a near ever-present for the Reds this season, missing just one game through injury and starting all but two games in the Premier League and Champions League. The left-back has been a model of consistency for Jurgen Klopp, and his continued availability has provided stability alongside Virgil van Dijk on that side of the defence. He will be absent for the first leg of the quarter-final tie against Porto in the Champions League, but the hope will be that otherwise he is able to start every other game this campaign. That is not the case for Scotland, however, with Robertson pulled out of their squad to play Kazakhstan on March 21 as he requires surgery for a dental problem. 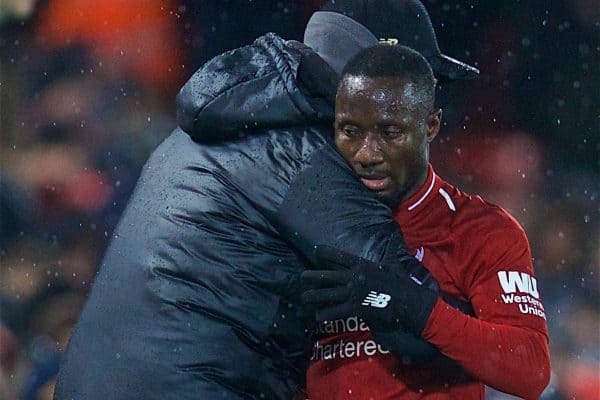 According to BBC Sport, the 25-year-old met his team-mates in Glasgow after Liverpool’s 2-1 win at Fulham on Sunday, but did not join them on the flight to Astana. He will be considered for the second qualifier of the international break, when Scotland visit San Marino (March 24). While losing their captain for any game is certainly a blow for Alex McLeish’s side, Robertson’s omission against Kazakhstan should please Liverpool’s medical staff. The reason for this came in Aberdeen manager Derek McInnes’ comments on why his defender Scott McKenna would be “a doubt” for the clash at the Astana Arena. “If he does travel, I’m not sure he’ll be fit for that first game. The tightness of the thigh, the travelling, the astroturf pitch,” McInnes explained. The Astana Arena is a 30,244-seater stadium in Kazakhstan’s capital, which serves as home to both FC Astana and FC Bayterek, and as McInnes notes, its playing surface is artificial. While playing on an artificial pitch would in no way exacerbate any problems with Robertson’s teeth, there are common concerns with injuries on astroturf. 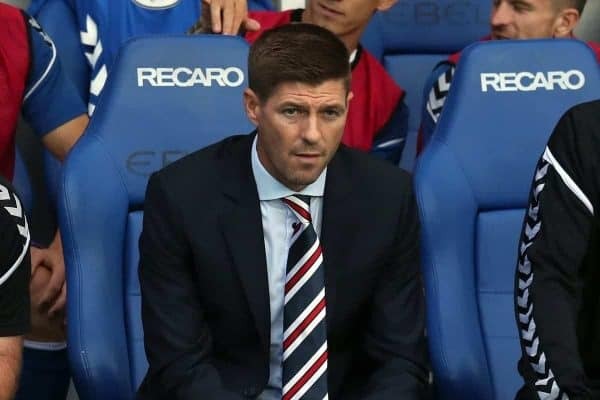 Steven Gerrard was critical of Kilmarnock’s 3G pitch after winger Jamie Murphy suffered an ACL injury twisting in the turf at Rugby Park in August, ultimately ruling him out for the entire season. “If you ask Jamie right now he’ll say it was a pitch incident,” Gerrard said. “I’m not here to disrespect Kilmarnock and their playing facilities. I know it helps support the running of their club. “But my opinion is elite football shouldn’t have any plastic pitches. “He planted his foot, got a wee nudge and then just felt something go. If that’s on grass, that’s not going to happen,” he added. “Do I think it’s fair to play the same game on different surfaces? Yes, rain, snow, whatever, that’s OK,” he argued. The San Marino Stadium, which will host Scotland’s second game of the break, is turfed with grass.